Before the workday is quite over, we wanted to send you off with a little artistic recipe inspiration, courtesy of one of our community members. 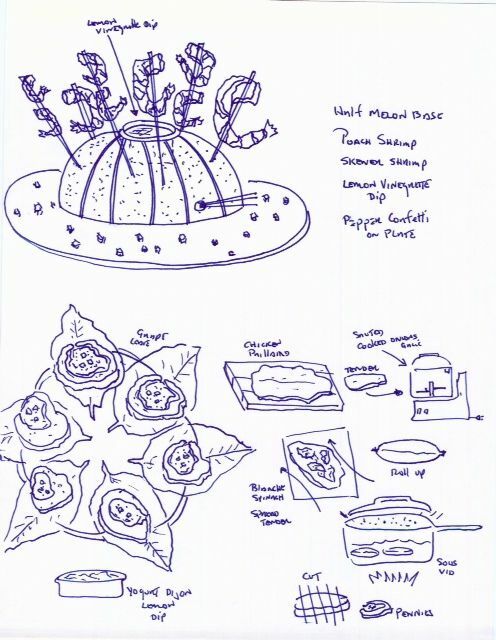 Home-cook Scott Thaler sent us this drawing with a subject line of "I write recipes like this," and we think that everyone could take a page out of his drawing pad now and again. Food is so visual -- recipes by illustration are a welcome change of pace. Thanks, Scott, for sending us your work. We're glad we got to share it with the community! I follow "They Draw and Cook" on its website as well as Facebook and always enjoy reading the many talented artists who submit recipe illustrations! In this day of eat-off-the-page photos in cookbooks, I miss the line drawings that could tell the story. The Thursday Night Feast (Sigrid M. Shepard), The Joy of Cooking, The Tassajara Bread Book (Ed Espe Brown), to name a few -- the drawings adorn and instruct. Another thank you to Scott Taylor.